Aluminum, Brass and Stainless Steel Hand Rails. Specializing in Architectural Ornamental Handrail and Railings for the Construction Industry. .... "Dam Security Gate Project"
.... "Medical Centers and Hospitals"
.... "Airport Stainless Steel Guard Rail and Handrail with Perforated Stainless Steel Panels"
.... "Stainless Steel and Glass Handrails"
... Stainless Steel Wall Returns with Brush Finish. ... Stainless Steel Wall Brackets. 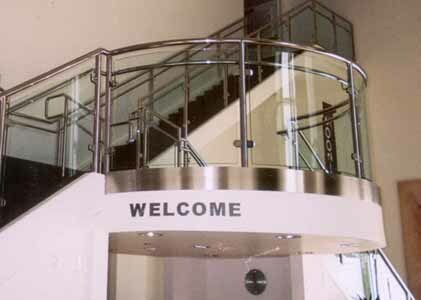 ... Prefabricated Stainless Steel Picket Railing. ... Online Ordering coming soon!! Contact us for ordering information.